The key to the R-Motion is a 1" tall sensor, made by Rapsodo. Earlier this week, the National Golf Foundation released its annual report on golf participation in the U.S. And, for the first time, the report included off-course participation. Specifically, the advent of Topgolf facilities, driving ranges and indoor golf simulators accounted for "an estimated 20 million off-course participants in 2016. Of those, 8.2 million didn't play on a golf course." Topgolf is the primary growth driver but indoor simulators have their place, too. How much would you pay for an at-home simulator? Current ones range from $2,000 to $50,000. Obviously, you get what you pay for. A brand new option, called the R-Motion Golf kit, will cost you just $300. All you need is a piece of carpet, hitting net, and enough area to make full swings using your own clubs to hit a real ball. The key is a 1" tall sensor, made by Rapsodo, who provides the ball tracking technology for the SkyTrak launch monitor as well as Rapsodo's own baseball training device that records pitch velocity, spin rate and amount of break. To get started, simply slide the Bluetooth-enabled 10-gram sensor onto a clip that you've attached to the shaft. When you swing away, the device tracks club movement in 3D and even analyzes the amount of vibration at impact to determine whether you pured the shot or mis-hit it. The sensor estimates clubhead speed, angle of attack, loft and energy transfer, and links the information to The Golf Club video game software so you get simulated shot trajectories, distances and so on. The kit comes pre-loaded with 15 courses (including Pinehurst #2) that you can play digitally from the comfort of your living room. Though the R-Motion gives plenty of swing data, it's meant as a virtual game rather than as a launch monitor or teaching tool. At the present time, the device is compatible with PCs only and can get up to four hours of playtime between charges. 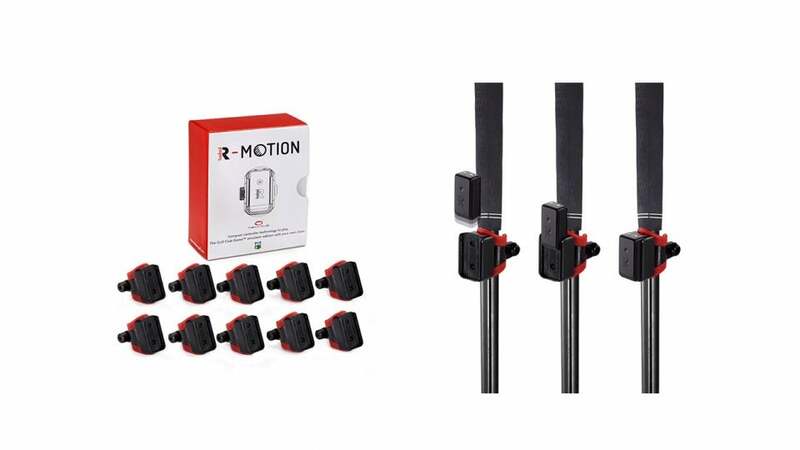 For $300, you get the R-Motion sensor, four clips that go onto shafts, a USB charging device, an Allen key, and a dongle that connects the sensor to your PC. A set of 10 clips is sold separately for $90. The company expects to offer an all-in-one package later this year (price to be determined) that includes the base unit plus 14 sensor clips, so you won't need to switch them between clubs while you play. You can buy the R-Motion Golf kit through rmotiongolf.com.